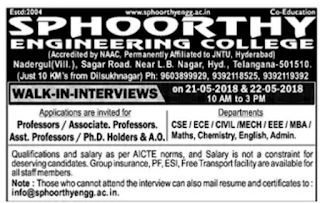 Sphoorthy Engineering College, Hyderabad has advertised in THE DECCAN CHRONICLE newspaper for recruitment of Professor/Associate/Assistant Professor/A.O jobs vacancies. Interested and eligible job aspirants are requested to walk in on 21st May 2018 and 22nd May 2018.Check out further more details below. 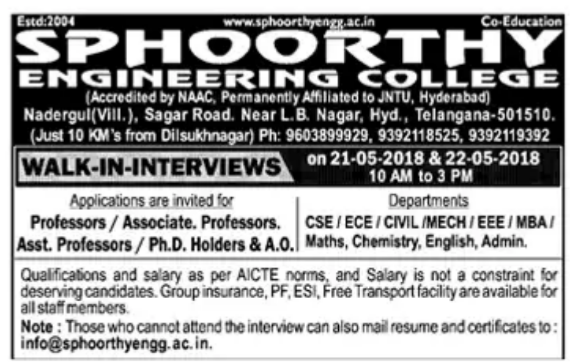 Name of the College: Sphoorthy Engineering College, Hyderabad. About College: Sphoorthy Engineering College is an undergraduate and post-graduate college located in Nadargul Village, Saroornagar Mandal, Hyderabad, Telangana state in India. The college has been established in the year 2004 with the approval of AICTE. It is affiliated to Jawaharlal Nehru Technological University, Hyderabad. Group insurance,PF,ESI,Free Transport Facility are available for all staff members. How to Apply: Interested & eligible candidates attend walk-in on 21st and 22nd May 2018.10a.m. To 3p.m. Reference: Advertisement on THE DECCAN CHRONICLE newspaper Dated 17th May 2018.